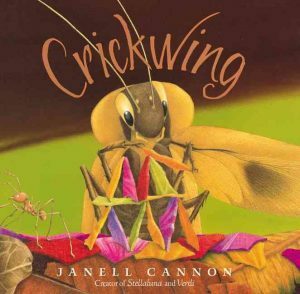 You don’t need to be a budding entomologist in order to enjoy Crickwing. Who knew, except perhaps author Janell Cannon, that we could all fall in love with… a cockroach? Since Crickwing is from the same creator of Stellaluna, I suppose the story quality and mesmerizing illustrations of this lesson-filled children’s book should come as no surprise. After an unfortunate mishap with a hungry toad, Crickwing’s broken wing makes him an outcast from all the other cockroaches in the forest. To avoid the pain of being teased, he runs off to find himself in quite dangerous and vulnerable situations. One day Crickwing discovers a colony of ants. Compared to these tiny creatures he begins to feel rather powerful. But the ants eventually tire of letting him pick on them as others had picked on Crickwing. Soon the ants take matters into their own hands. In the early pages of Crickwing we find ourselves feeling sorry for this poor little picked on cockroach. Then, when he becomes a bit of a bully himself, we don’t quite know whether we should keep rooting for him or not. Sure, Crickwing may be in pain, both emotionally and physically, but that’s never a good excuse for such bad behavior. Will he be punished by the ants he chooses to torment? For a moment, it appears as if he will be. Then kindness wins, the ants show mercy, and Crickwing has an opportunity to redeem himself. Not only does Crickwing choose to do the right thing, but in the end he uses his special talents, teamwork, and plenty of creativity to save the day. Recommended for ages 7-9. Plus, this book offers a great way to start (or continue) a discussion about bullying and compassion for others. Looking for even more inspiring Children’s Book Finds? Click here.